Are Side Hustles Worth the Sacrifice? Many personal finance experts recommend side hustles as a way to earn extra money. But are they worth it? After all, you have to give up your time in order to make them truly work. In my opinion, side hustles are not only worth the sacrifice, they’re necessary. Side hustles provide a crucial back up plan if your main job goes south. Plus, they can provide much needed financial assistance. CNN recently estimated that over 44 million Americans have side hustles. That’s a lot of hustling! When I first started side hustling, I had a good reason for doing it. I needed extra money to pay my student loan bill. At the time, my husband and I had just moved out of the country. I had no job prospects and bills to pay. So, my first goal was to make sure I made enough money to pay my $295 student loan bill. I knew that I didn’t want to put my loans in forbearance and figured if I worked hard enough, I could find a way to make money online. It turns out, the Internet was full of job opportunities for someone with my skill set. My first side hustle was writing articles for a blog at $8 per post. Then I started editing papers, helping professionals write their LinkedIn bios, and more. Before I knew it, I was bringing in over $1,000 per month from my side hustles. Eventually, these side hustles grew into my full-time job. And for the past four and half years, I’ve worked as a self-employed blogger and freelance writer. are side hustles Worth the Time? I’ll be honest. When I first started side hustling, I didn’t have kids. I did say no to a lot of social events, though. Even when I landed a full-time job abroad, I left work every day at 5:00 p.m., came home, and worked on my side hustles. I still believe that those years were the most productive I’ve ever been. I stayed focused on my goal of increasing my income, and it worked. These days, I need to make hard choices about how I spend my time since I have two little ones. However, thanks to my hard work during my early years of blogging and freelancing, I now work less and get paid more. Keep in mind, though, that most people have more time for side hustling than they think. Many people waste hours each day watching TV and looking at Facebook. During those beginning years of side hustling, I went without a TV in my house at all. If you’re thinking about side hustling but are concerned about time away from your family, I recommend logging your hours for a few weeks. The results might surprise you! They might show you that you have more time available to make extra money than you thought. Here are other ways to find more time if you think your schedule is too full for a side gig. Finding the right side hustle is important. For example, I’m not signing up to be a bouncer at a club every weekend because hey, I’m a mom and I’m not that intimidating. Similarly, I’m not signing up to drive for Lyft because I usually cart my kids around (UberEats could be a good option though thanks to not having to drive people around in my car). If you are interested in driving for Lyft though, they offer a $250 bonus to new drivers to help you start earning, which is pretty sweet. There are more ways to make extra money beyond driving your car, of course. 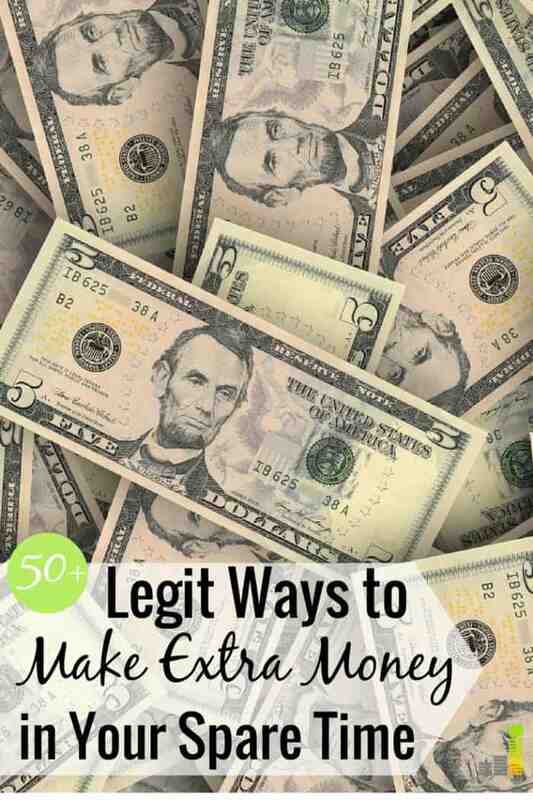 Here are 50+ ways to make extra money, many of which you can do in your free time. My all-time favorite side hustle is starting a blog. It’s my go-to recommendation because of the impact blogging has had on my life. However, keep in mind that starting a blog takes a lot of work and time before you’ll earn money. Given this, it’s important to make sure blogging is a good fit for your situation. Check out our guide on how to start a blog for more information to get started. If you don’t know where to start in beginning a side hustle, consider your current job and skill set. The best place to start might be in your own field. For example, I have a friend who is an engineer and he uses overtime as his side hustle. Given the immense workload at his job, his boss is happy to pay him time and a half to help reduce the load. My husband, a physician with a busy schedule and very little time on his hands, found a few companies that hire physicians to answer very specific surveys or serve as an expert witness. These are lucrative side hustles that he’s exploring to help pay back his medical school loans. If you’re still unsure where you can look for a side hustle, ask your friends, family members, and co-workers if they have ideas to supplement your income. It might surprise you how quickly you can start a side hustle that results in extra money in your pocket. Depending on your situation, a side hustle can be a great idea to help you reach a goal. Many think they need a specialized skill to make extra money on the side. Thankfully that is not the case in most circumstances. All you need is a willingness to give up some time and a little creativity to make many side hustles successful. Do you think side hustles are worth the time and effort? How do you find time to make extra money? Do you have a side hustle to make ends meet, or do you have one to provide for luxuries you normally couldn’t afford? The post Are Side Hustles Worth the Sacrifice? appeared first on Frugal Rules.